One of the first things you’ll see coming down the hill to the lake is the art deco lighthouse. Whether you are boating, fishing, walking on the beach or in any of the lakeside parks, this iconic symbol of the community has kept watch at the end of a half-mile long pier for almost 85 years. 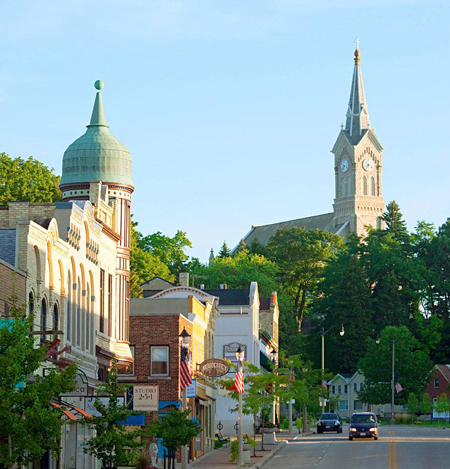 It has served as a touchpoint and inspiration for visitors, residents, artists and photographers. A walk out to the lighthouse is tradition for many festival-goers. Now, for the more adventurous, there is spear-fishing! Yes, you read that correctly. There’s something to be said for putting on your SCUBA gear, grabbing your spear gun and jumping into Lake Michigan to go fishing! 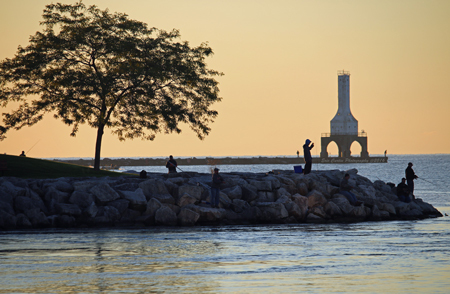 Plan your Lake Michigan fishing trip or vacation with our visitor’s resource guide for hotels, bed and breakfasts, shopping, events, farmers markets, lakefront festivals and more. Once you are here, make sure to stop by the historic Pebble House Visitor Center for more information. And don’t forget your camera – there are breath-taking views everywhere you look.